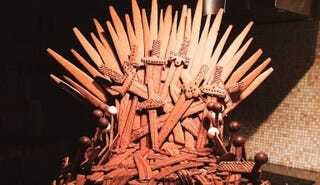 Seriously, this gingerbread version of the Iron Throne from Game of Thrones is just so well done. If Princess Bubblegum crossed the Narrow Sea and conquered Westeros, this is probably the throne she would sit on. Right before she started doing unholy experiments to create candy White Walkers.